Wash & peel bottle gourd. Cut the bottle gourd into medium sized pieces. Take a microwave safe bowl and add the bottle gourd pieces and 25ml water. Place this bowl in oven and cover it partially. Cook on high power for 5 minutes. Stir the vegetable pieces once and again place the bowl in oven. Cover the bowl partially and cook on high power for 5 minutes. Allow 2 minutes standing time before removing the bowl from oven. Drain any excess water from the bottle gourd. Break each red chili into 3 pieces. Usually, for this recipe we need only one red chili. But for those who wish to have this dish to be spicier may add 2 red chilies. Heat pan and add oil to it. When oil is hot add the black gram and fry till the seeds start changing color. Then add mustard seeds and cumin seeds. Fry till the seeds splutter. Add curry leaves and red chili pieces. Fry the seasoning well and add the cooked bottle gourd pieces. Mix well and add salt. Mix well. Cover & cook the vegetables for 3 minutes on low flame. When cooked covered the vegetable absorbs salt and gets the taste. Mix after 3 minutes and transfer the curry to a serving bowl. 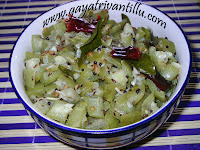 Serve hot with plain rice, VADIYALU & CURD CHILIES. Ingredients & Preparations of this recipe is same as above. Heat pan and add oil to it. When oil is hot add the black gram and fry till the seeds start changing color. Then add mustard seeds and cumin seeds. Fry till the seeds splutter. Add curry leaves and red chili pieces. Fry the seasoning well and add the cooked bottle gourd pieces. Turn the flame to high and add 50ml milk little at a time mixing all the while. Add little milk to the curry and mix gently till all milk evaporates. Then again add some more milk and mix well till milk evaporates. The bottle gourd pieces absorb the milk and the curry becomes dry. Like this add milk and mix well and use all the milk taken. When the curry is dry add salt and mix well. Take care to add salt after finishing the entire milk taken in this recipe, otherwise the milk will curdle. Transfer the curry to a serving bowl and serve hot. 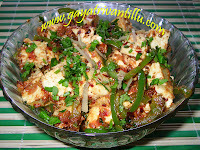 Ingredients & Preparations of this recipe is same as that of bottle gourd curry with milk. Heat pan and add oil to it. When oil is hot add the black gram and fry till the seeds start changing color. Then add mustard seeds and cumin seeds. Fry till the seeds splutter. Add curry leaves and red chili pieces. Fry the seasoning well and add the cooked bottle gourd pieces. Turn the flame to high and add 50ml milk little at a time mixing all the while. Add little milk to the curry and mix gently till all milk evaporates. Then again add some more milk and mix well till milk evaporates. The bottle gourd pieces absorb the milk and the curry becomes dry. Like this add milk and mix well and use all the milk taken. When the curry is dry add salt and mix well. Take care to add salt after finishing the entire milk taken in this recipe, otherwise the milk will curdle. Add powdered jaggery and mix well. Cook the curry till jaggery melts and mixes with the curry. Transfer the curry to a serving bowl and serve hot. This recipe is soft (KAMMAGA) in taste, so use only one red chili. However for those who wish to have it spicier may add 2 red chilies. In the second & third recipes take care to add salt after adding milk. If you add salt first and then add the milk, the milk will curdle . As it is, bottle gourd is bland in taste. So when we prepare the curry the taste of the curry it will be soft (KAMMAGA UNTUNDI). When we add milk the bottle gourd absorbs the milk and gets a unique taste (INKA KAMMAGA UNTUNDI). When we add jaggery to the milk flavored curry it will enhance the taste with the sweet touch. Generally children do not like the bottle gourd as it tastes bland. But the sweetened milk flavored bottle gourd curry is even enjoyed by children. Bottle gourd contains Vitamins A, B and C, iron, magnesium, sodium, potassium, sulphur and fiber. I recently discovered your website and am now checking in regularly. The way you give the step by step procedure is really fabulous. I tried few of your recipes and each one turned very good. Thank you so much. I have a request for few recipes. Hope you will post them soon. They are vellulli kaarappodi and the authentic burelu recipe. First of all I would like to say thanks ur site is really really very helpful.... I was searching for bitter gourd recipe on youtube and I came across ur site. Im a north indian married to south indian guy so I can only understand few telgu words but inspite of language barrier , I can understand ur recipies and at the same time I get to learn new telgu words. your site is really a blessing for newly married couples who are away from ther family (inlaws & parents) and home country.Your site is very user friendly.I really liked your article about weight loss (life style change). Well I would like to suggest that you could also wright something about beauty tips. So that ladies who visit your site can cook good healthy food and mantain their weight or reduce their weight and at the same time look beautyful by using some beauty tips.